I'm not a big carp fan. I avoided it during our trip to Brno, though V likes it and had some. To compensate, we made our own fish dinner when we got back to Prague on December 26th. This is our very fresh Monkfish, cut into small pieces and marinated in soy sauce, garlic, and ginger. 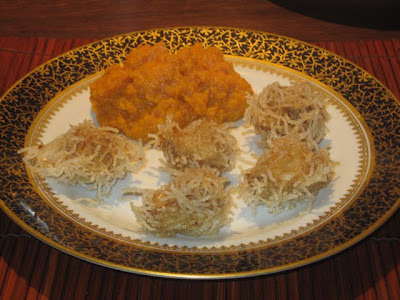 It was then lightly fried in cornstarch, egg, and rice noodles. On the side is sweet potato with brown sugar, salted butter, and fresh lemon juice. 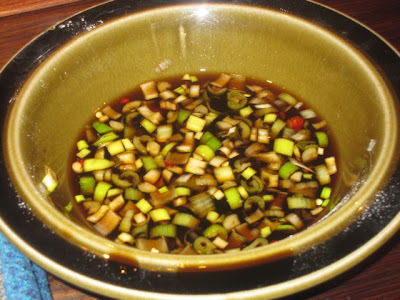 For dipping, we had a mixture of soy sauce, rice vinegar, and sugar that was boiled with chopped green onion and a few slices of potent bird chilies. We enjoyed it very much. Then, we opened some wine and watched the 1970 musical version of "Scrooge" with Albert Finney, which we both have a soft spot for. A little ritual of ours. LOKAL as been on Prague Spoon. Is now on Expats.cz, will be on Czech Please at the weekend. And today in the Prague Post. Is this a record ?. Could be. It's the place everyone is talking about. It was also reviewed by the new critic at Prague TV. However, I think my take is perhaps the only one that had anything even remotely negative to say about Lokal. I am a fan of your blog. I usually look at restaurants you've been to and reviewed whenever I want to try out something new. check it out if you have time. It is in Ins and outs of Prague, Czech Republic. Great pictures, Geronimo. Really beautiful work.